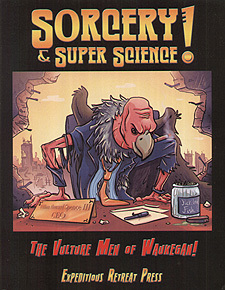 The Vulture Men of Waukegan! Ruling from a roost in the ruins of ancient Waukegan, The Vulture Men of Waukegan control a small territory of roughly 100 square miles just north of the massive ruins of old Chicago. The Vulture Men have a strict hierarchical society based upon the corporate organizations of the company that once owned their ancestral roost, and they believe they are the rightful heirs of Lancaster & Penn Real Estate Development, Inc. The territory has little to offer the average mutie, being composed of only a few small settlements, but the ruins in the area are ripe for exploration by scavengers. Scars should expect a tax visit from the Vulture Men however, so have gifts at the ready. According to our sources, Vulture Men love to eat pickled fish.